The sun was shining brightly into our apartment this morning and made me want to get out. 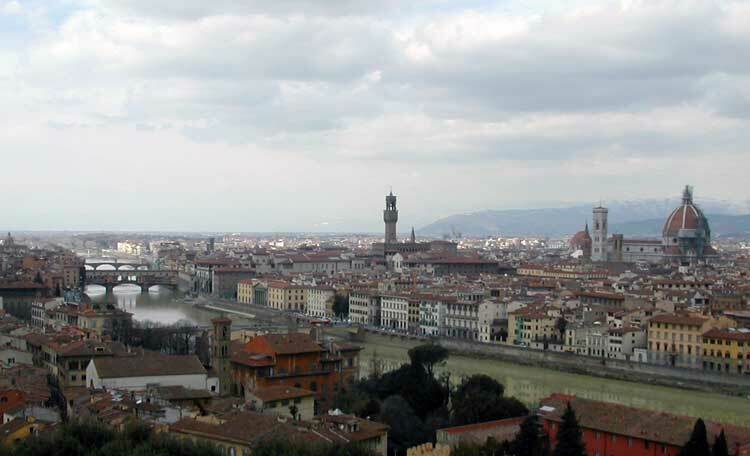 After breakfast I decided to take Dave up to La piazzale Michelangelo. Since we arrived back in November, we've only visited a few things downtown because the weather has been quite chilly. We were driven up to the piazzale once last year during our first trip to Florence, but today we decided to walk up. We walked across the Ponte alle Grazie and then into the San Niccolò area. I had my camera in my purse and Dave held his so he could take a few shots along the way. This little pocket of Florence always reminds me of a small Tuscan village because it's so secluded. I felt so removed from Florence already and yet I was only about 1/2 mile from our apartment. We walked up the Via di Salvetore al Monte, which are the steps that take you up the hillside to the piazzale. Once we arrived on top, we were treated to a spectacular view of Florence. There were two couples taking pictures on the staircase facing the city as well as many tourists walking around taking pictures of themselves and of the view. There is another statue of David here. There are probably five or six of these replicas scattered throughout Florence while the original stands in the Galleria dell'Accademia. When I first came to Florence I got confused because every time I went to a new area, David would be standing in the middle of the piazza. This large piazzale has a terrace that offers some amazing views of Florence. I took the picture of the Duomo in the header of my blog website from there. After walking around taking pictures overlooking the city, we decided to sit in an outdoor café overlooking the countryside. We sat and talked and took in the view. It was great because there were only about six of us there on the terrace. The man at the bar asked me if it wasn't too cold to be out there, but I told him, "Al sole si sta proprio bene." (In the sun, it's really nice.) It is amazing to see the quiet rolling hills with grape vines and olive trees on one side of the huge brick wall and on the other side is the city of Florence. We went to my favorite church in all of Florence: San Miniato al Monte. Dave and I walked around the inside of the dark and cold church. I love the many different styles and architectures throughout. I feel so peaceful inside the church, it's as if nothing else exists and time stands still. We're planning on walking around town again tomorrow and hopefully every weekend if the weather is as nice as it was today. I now want to see more of Florence and of Tuscany...so we'll see where this whim of mine takes us next.